The Question of The Day Is Why Does The Submarine Have A Giant Eye?! 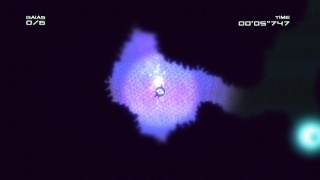 Abyss was originally released on the DSiWare service and was given fairly positive reviews from critics, but it lacked content. The Wii U iteration of the game has plenty of new content so how does this version of the game fare? Keep reading to find out! You take control of a "cyclops submarine" and try to find enough energy source to keep humanity alive in the depths of the ocean! 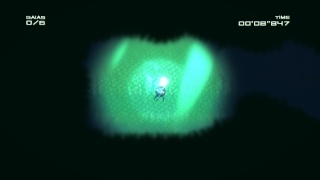 The game is horizontally and vertically scrolling adventure game where you have to avoid obstacles while navigating the dangerous cave like depths of the abyss while collecting energy spheres. The first few missions start off fairly easy, but the game becomes extremely difficult later on in the game! There are several unlockable levels that are insanely difficult later on in the game, however with enough practice most people can likely beat this challenging title so it's not hopelessly difficult, but will provide very challenging gameplay! The multiplayer mode is a fun addition to the game and is really fun to play. The controls in the game are quite difficult to master and will take some time to get used to, however this isn't a flaw in the game as it is caused by the in-game physics, but once you get used to the controls you will start enjoying the game much more! Expect it to take at least 6-8 hours to fully learn the game's physics. This is really the only thing that I didn't like about the game, but it's not a major issue. 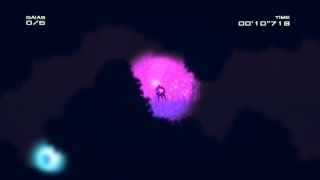 The graphics in the game are silhouette based, similar to Knytt Underground and other games with the art-style, however it isn't on the same level as Knytt Underground. That said the graphics are still quite good and the water effects and lighting really pop in HD! The voice acting in the game can be somewhat annoying, but the music on the other hand is really atmospheric and fits the game very well! With great, yet challenging gameplay, nice HD visuals, and excellent atmospheric music Abyss is a great addition to any Wii U library of games! But difficult to master controls can make the game frustrating to new players, however we still highly recommend this game, especially at its price-point! Well it lasted me 3 and a half hours until I completed Mission and Dark Mode (a total of 20 stages) and my friends lost interest in multiplayer (why no level select?). It was 1.99€ only, but I think they could have made a lot more stages with more variety, and more music (not just 3 tracks looping way too much). I'm not into speedrunning missions over and over again (what this game seems made for) or trying to beat an ultrahard challenge like the Arcade Mode. I'd rather have this kind of game with a story, see lots of potential there. The score seems high, but it was entertaining to read. Is this going to release here in the outback? Good review, though I think that the score should have been a little lower. This review has been featured on Miiverse by Enjoy Up games! 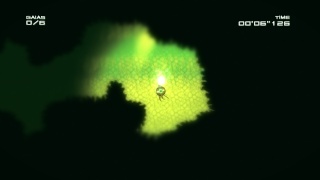 @FuManchu wrote: This review has been featured on Miiverse by Enjoy Up games! @Talesfanatic wrote: The Abyss rules! Objection! It doesn't rule it's cool! I already have this on my DSi and it's a decent game. @SKTTR wrote: Well it lasted me 3 and a half hours until I completed Mission and Dark Mode (a total of 20 stages) and my friends lost interest in multiplayer (why no level select?). It was 1.99€ only, but I think they could have made a lot more stages with more variety, and more music (not just 3 tracks looping way too much). I just added your opinion as a second opinion in the review! Thanks for sharing your thoughts about the game.